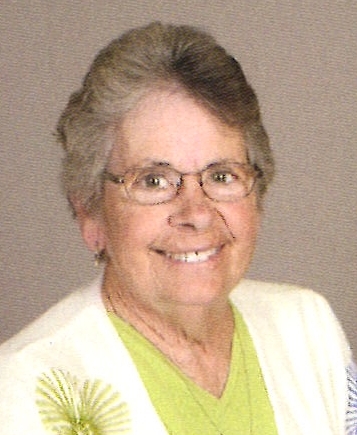 Services for Helen F. Drummond, 81, Donahue, will be 10:30 a.m. Tuesday, April 9, 2019 at St. Ann's Catholic Church, Long Grove. Burial will be at St. Ann's Cemetery. Visitation is 3-7 p.m. Monday, April 8, 2019 at the church, with additional visitation one hour prior to mass time Tuesday. Helen passed away on Friday, April 5, 2019 at University of Iowa Hospitals and Clinics, Iowa City, surrounded by her family. Halligan-McCabe-DeVries Funeral Home, Davenport, is in charge of arrangements. Helen Faye Hoffmann was born April 16, 1937 in Donahue, Iowa the daughter of John H. and Ethel (Wuestenberg) Hoffmann. She was united in marriage to James G. Drummond on August 24, 1957 at St. Ann's Catholic Church. Helen was a housewife who loved providing for her family. She also enjoyed bowling, playing cards, volunteering at Genesis East gift shop and attending her grandchildren’s activities. Her memberships include St. Ann's Guild and Donahue American Legion Auxiliary. Survivors include her children and their spouses, Joseph (Brenda) Drummond, Long Grove, Dean (Melissa) Drummond, Donahue, Edward (Brenda Brown) Drummond, Davenport, Jacalyn (Todd) Bender, Long Grove, and Jennifer (Terry) Henningsen, DeWitt; nine grandchildren Rachel (Sean) Burmeister, Nicole (Andy) Roth, Carmen (Jeff) Paulsen, Dana and Maddox Drummond, Mollie Bender, Derek, Fayeth and Ty Hennningsen, and six great-grandchildren Liam and Rhett Burmeister, Nora and Olivia Roth, Kinnick and Copeland Paulsen; and special friend Ray Loussaert; brother Allyn Hoffmann, brother-in-law Hub Hughes; sister-in-law Sharlene Hoffmann, and many loving nieces and nephews. She was preceded in death by her parents, husband James, sister Dorothy Hughes. May they rest in peace. In lieu of flowers, memorials may be made St. Ann's Church or Donahue Fire Department.